Thomastik Belcanto Double Bass Strings are designed for the bassist primarily playing arco. The unique steel rope core offers a dark, warm tone with excellent resonance and a wide range of color to its tone. These double bass strings are thinner than many other double bass strings, but still offer a surprisingly robust sound. Belcanto Double Bass strings feature a quick bow response and a natural pizzicato sound for Jazz. 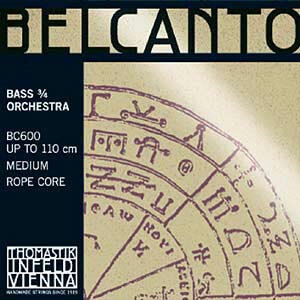 Belcanto double bass strings have quickly become the standard for arco bassists. Made with a specially twisted steel rope core, Belcanto Solos have a dark/warm tone with excellent resonance. They have a wide range of tone colors, are easy to blend and provide outstanding projection with moderate effort. They also settle-in quickly, intonate reliably and stay in tune.